Here is the first chapter of Child of Fire. It’s under 5K words, and I’ll put the bulk of it under a cut to spare the sensitive and uninterested. It felt good to sit behind the wheel again, even the wheel of a battered Dodge Sprinter. Even with this passenger beside me. The van rumbled like a garbage truck, handled like a refrigerator box, and needed a full minute to reach highway speeds. I’d driven better, but I’m a guy who has to take what I can get while I’m still alive to get it. The passenger beside me was Annalise Powliss. She stood about five foot nothing, was as thin as a mop handle, and was covered with tattoos from the neck down. Her hair was the same dark red as the circled F’s I used to get on my book reports, and she wore it cropped close to her scalp. It was an ugly cut, but she never seemed to care how she looked. I suspected she cut it herself. She was my boss, and she had been forbidden to kill me, although that’s what she most wanted to do. “Where are we going?” I asked for the fourth time. She didn’t answer. She wasn’t talking to me except to tell me where to drive. To be honest, I didn’t blame her. She had good reason to hate me. At the moment, though, she and I had a job to do and all I knew about it was this: Annalise was on her way to kill someone. Maybe several someones. I was supposed to help. Because she wouldn’t talk to me, I was not entirely clear who had ordered her not to kill me or why they would bother. I was just the driver, and I didn’t even know where we were going. “Quarter tank,” I said as we approached a gas station. I hated to drive on less than a half tank of gas, but so far the boss had refused to let me fill up. Since she had the money, the title, and the physical strength to tear my arm off, she made the decisions. She glanced down at the scrap of wood in her hand—unpainted and unfinished except for the twisted nonsense shape made of several colors on one side—and said nothing. I stifled my irritation and drove past the pumps. We were westbound somewhere on the Olympic Peninsula. There were no other cars on the road. The streets were slick with misting rain, and the sky was growing dark as evening approached. After my years in Southern California, I’d forgotten how long it could take for night to fall in this part of the world. The road was one of those rural highways with one lane in each direction and a speed limit of fifty-five. I was staying below the limit because the van, with its balding tires, whining brakes, and load of equipment in the back, wasn’t equipped for the twists and turns of backwoods driving. I was enjoying the drive anyway. I had a key to the door and I could see the sky. It felt good to be a free man again. Up ahead, I saw a big cedar right up close to the road. Annalise was not wearing her seat belt. I was wearing mine. The speedometer on the Sprinter shuddered at the fifty-miles-per-hour mark. All I had to do was swerve. She and her little scrap of lumber would fly through the windshield and slam against the tree, while I would be safe in the arms of the shoulder harness and air bag. I didn’t try it. It wasn’t just the motorcycle Annalise kept on flimsy mounts in the cargo area behind me. In truth, I doubted that slamming face-first into a tree trunk would do more than muss her thrift-shop clothes. And piss her off. She’d survived worse. I’d seen it. I was pretty sure Annalise wasn’t a human being. She had been, once, I thought, but I wasn’t sure what she was now. A Volvo station wagon with luggage strapped to the roof drove eastbound toward us. As it passed, the painted scrap wood in Annalise’s hand flashed like a camera flashbulb. The design painted on the face of the wood began to twist like a nest full of snakes. I was already doing it. I hit the brakes and twisted the wheel, letting the clumsy van fishtail as much as I dared. I heard crashing noises from behind me as Annalise’s things toppled over. We came to a rest, and I threw it in reverse. I backed up onto the shoulder, swung the wheel all the way around, and stomped on the gas. We crept after the station wagon. She settled back into her seat and glared through the windshield at the empty road ahead. I forced myself to smile at her. “Isn’t this nice? Our first job together and we’re getting along so well.” It was stupid and dangerous to taunt her, but I was afraid of her and I hated to show my fear. She ignored me, for which I was secretly grateful. We picked up speed, rounding curves and topping hills the van could barely handle. Night was coming and the forest around us was filling with shadows. I switched on the headlights, but Annalise snarled at me to turn them off. A red light flashed from between the trees on the right. I slowed. Annalise started to protest, but I shushed her. She didn’t look pleased about that. We came to a break in the forest—a gravel parking lot with a row of abandoned wooden stalls at the back. It looked like it had once been a roadside farmer’s stand. The station wagon was parked at the far end, red brake lights glowing. I parked a couple of car lengths away from the vehicle and jumped from the van as quickly as I could. Annalise was a little faster. She walked toward them, holding the fist-sized scrap of wood in her hand like a Geiger counter. The design on it writhed wildly; something about the car or the people in it was setting it off. All the wagon’s side doors stood open. A man and woman had their head and shoulders in the back doors, and they were working frantically at something. I checked their stuff. Among the things strapped to their roof was a vacuum cleaner in a clear plastic trash bag beaded with rain. These people weren’t on a camping trip. They were skipping town. All I could see of the man was a pair of extra-wide Dockers and the pale skin that peeked above his sagging waistband. Office worker, I thought. He must have heard us approach, but he didn’t turn to look at us. Was he completely engrossed, or did he have a weak survival instinct? Out of unshakable habit, my next thought was: Victim. No, no. I pushed the thought away. That was not part of my life anymore. From what I could see through the car windows, the woman was also wider than strictly necessary and also dressed for casual day at the office. They continued to struggle with something in the backseat. The pressure against my chest increased. Then their little boy climbed out of the car. Flames erupted around his head. I felt light-headed suddenly, and the pressure against my chest vanished. Before I could think about it, I ran toward them, stripping off my jacket. The woman screamed. The flames around the boy’s head spread downward past his crotch. In an instant, his whole body was ablaze. The father fumbled for a jacket draped over the driver’s seat. I heard Annalise’s footsteps behind me. The father lunged at his boy with the jacket, knocking him to the gravel, then beating at the flames. I got there a half second later and slapped my jacket over the boy’s face and head. Rain steamed off the burning body. Beside me, the father made a noise like a strangled dog. I tried not to think about that. I tried not to notice the black scorch marks where the flames touched the ground. I tried not to think about what was happening. I just worked at the flames. I slapped at them, smothered them, wrapped them in my jacket. It was no good. The fire flared up and my jacket erupted in flames. I threw it aside and started to drag my shirt over my head. The kid laughed as though we were tickling him. Then his skin turned silver-gray and his whole head came apart. The flames roared. A wave of heat forced me back. The father rolled back onto his padded behind, almost bowling over his wife as she rushed around the car toward us. I let my backward momentum roll me onto my feet. Annalise stood nearby. She had unbuttoned the fireman’s jacket she always wore, revealing colored ribbons alligator-clipped to her clothes. She pulled a green one free. The small sigil drawn on the bottom glowed with silvery light. I turned back to the family. The boy’s head, arms, and chest had come apart and been transformed into a mass of fat, wriggling, silver-gray worms, each about the size of my pinkie. Then his stomach came apart, then his hips. It happened so fast I had no chance to think about it. I saw the worms twisting themselves against the packed gravel, trying to burrow into the earth. They swarmed over one another, heading west. Everything they touched turned black with scorched, greasy soot. I felt a tightness in my throat that might have been the urge to vomit, but there was nothing to bring up. I was completely hollow inside. The father struggled to his feet, and his wife tried to move around him to her son. The expression on her face told me she already knew the truth, already knew her son was gone, but she could no more stay away from his disintegrating body than she could leap up into the clouds. I tackled them. My shoulder sank into the father’s broad, soft belly, and I grabbed the mother around the waist. With all my strength, I pushed them away from the car. I didn’t look back at Annalise. I didn’t have to. I knew very well what those green ribbons did and how little she cared about collateral damage. The father and mother stumbled backward and fell over each other, hitting the gravel hard. I landed on their legs. I heard a whoosh of fire behind me. Annalise’s green ribbon had hit its target. I glanced back and saw flames, green ones this time, roar up around the wriggling mass that had once been a boy’s body. Where the flames touched them, the gray worms burst apart. The sphere of green fire expanded. I pulled in my legs, trying to get away, but I was too late. The cold green fire washed over me. I sucked in a lungful of air to scream my life away. It was too soon. Too soon. I looked down at my legs, expecting them to burn away to blackened, smoking bones. It didn’t happen. There was no pain, no damage to my legs, nothing. My clothes didn’t even burn. I felt nothing more than a slight pressure below my collarbone—a place the flames did not even reach. The flames receded. I was undamaged. So were the parents. I had pushed them out of range just in time. The worms had not fared so well. There was nothing left of them but gray slime. “Holy God,” the mother said, her voice thin and strained. Her face was slack and her eyes were glassy. If I hadn’t pushed her away, she would have been killed along with her son—another person struck down for no other reason than she was next to someone Annalise wanted to kill. Annalise took another ribbon from beneath her jacket. This one was blue. I had no idea what the blue ones did, but I knew it wouldn’t be good. Before she could use it, a force passed through me. It wasn’t a physical push. It struck my mind, my consciousness, whatever you want to call it, and it felt as though I was standing in heavy surf. It almost toppled me. At the same moment, I felt a twinge high on the right side of my chest again. Annalise staggered and winced; her blue ribbon fell from her hand. She felt it, too. The mother and father didn’t stagger. Their expressions went blank. “We pulled over to help— oh, forget it.” He slapped at the dust on his pants. They started walking toward the car, glancing back at me as if I was a stray dog that might bite. They did not look the least bit upset by what had just happened to their son. After they got into their car and slammed the doors, Douglas started the engine. His wife leaned into the backseat and fussed with a baby sleeping in an infant seat. I hadn’t noticed the baby until then. Douglas turned on the music. Bobby McFerrin. Gravel crunched under the tires as they began to drive away, as though they were leaving behind nothing more important than some old fast-food wrappers. Annalise charged past me, lowered her shoulder, and slammed into the car’s front panel, just above the wheel. Her legs pumped. The fender crumpled and the car slid sideways like a tackling dummy until it tipped into a ditch. She stood and straightened her jacket, a scowl on her delicate little face. I had seen her strength before, of course. She could have flipped the car onto its roof or torn the door off and pinched off Douglas’s head. I assumed the only reason she hadn’t done either was that she hadn’t finished with them yet. Douglas jumped out of the car to inspect the damage. He looked at the crumpled metal, then at Annalise, then all around. “I’m not done with you,” Annalise said. She stepped toward him. The wife leaned toward his window. “Douglas, get back in the car,” she said. She leaned into the backseat to check the baby. Still sleeping. Douglas let the keys in his hand jangle and backed toward the driver’s door. My own hands were shaking. I felt hysteria building in me. That little boy had called him Daddy, and now he was going to drive away as though he’d just stopped for a piss? They’d shrugged that kid off as if he was roadkill. I had never even met the kid before two minutes ago, and what I’d seen made me want to weep and puke my guts out at the same time. I didn’t do either. Instead, I got angry. My anger was growing too large for me, but I couldn’t stop myself. I needed to see a reaction from them. These people were going to show some grief if I had to wring it out of them with my bare hands. The man rounded on me. “My son didn’t call me anything! He’s only three months old!” he shouted. I ignored her. I just stared at Douglas, stunned and horrified. “You don’t care at all, do you?” There was no more anger in my voice, no accusation, only amazement. I was building toward something terrible, and I had no idea how to stop myself. If I had Annalise’s strength, I would have stripped the flesh from his bones. If I had her arsenal of spells, I would have burned him alive. It took a couple of seconds for that to sink in. The wave. The wave I’d felt after the boy fell apart must have hit them, too. It must have erased their memories. Why hadn’t it erased mine? Douglas was leaning back, one arm reaching toward his wife. There was a smack of metal slapping into a soft hand, and he came at me. I was distracted and off-balance; if he’d been faster, he would have killed me. But he wasn’t fast—he was an overweight office drone. A victim. I instinctively raised my arm to protect my head, and he slammed a tire iron onto my tattooed forearm. I felt no pain and barely even any pressure. Annalise was not the only one with tattoos. Like hers, mine were magic. Hers covered her entire body, but mine covered just a couple of spots, including the outside of my forearms and hands. Douglas thought he’d scored a winning blow. He smirked and waited for me to cringe and clutch my arm. Instead, I snatched the tire iron away from him and racked him up against the car. Annalise stepped up to him. “Wallet,” she said. He barely glanced at her. Annalise was a far greater danger to him than I was, but all of his attention was on the big, tattooed man, not the tiny woman. She had to repeat herself. His mouth opened and closed several times. He couldn’t think of an answer. “I—I forgot.” Sweat beaded on his lip. He glanced at each of us, trying to think of a phrase that would placate us and let him drive away. He thought we were crazy, and the way I felt at that moment, he wasn’t far wrong. “Hmm,” Annalise said, as though she was unsatisfied with his answer. There was a moment of silence. Douglas couldn’t bear to leave it unfilled. I wondered if this was the moment she would kill them both. That made him a little bolder. “Sure, sure, I understand. We’re just a little confused. All of us. The baby didn’t call me Daddy, right, Meg? He’s too young for that. We all looked into the backseat. A plastic car seat was buckled onto the far side of the infant’s seat. A small one. The boy who had just… I wasn’t ready to approach that thought yet, but he was too big to be sitting in such a small car seat. Had they lost more than one? Had they forgotten that, too? Douglas and Meg looked to each other for an explanation. Silence. Douglas turned to us and said: “We’re bringing it to my sister?” As if he was guessing. “There are scorch marks on it,” I said. They were the same sort of marks on the ground where the boy had. . . The Bentons didn’t seem to know what to make of that. The blank confusion on their faces was fascinating. They really were enchanted. My anger was still going strong, but it wasn’t directed at them anymore. I was beginning to pity them. Meg went to the backseat, unbuckled the car seat, and heaved it toward the woods. It bounced once on the gravel and disappeared into a patch of nettles. Annalise gave him a sour smile. She took the scrap wood from her pocket and laid it against the station wagon, then against Douglas’s ample belly. The designs twisted, but more slowly than before. “Does this hurt?” Annalise asked. She walked around the car and laid the scrap of wood on Meg’s palm. Douglas stared at something fascinating in the gravel at his feet. That’s when I noticed his hands. They were red, swollen, and shiny wet. Burned. He didn’t seem to be in pain. If I pointed them out to him the way we had pointed out the car seat, would he suddenly “remember” them? Would he suddenly be in terrible pain? “Get out of here, Douglas,” I said. We didn’t need to tell him twice. Douglas jumped into his car and peeled out of the lot. I told her what she could do with herself. “Enough with this weepy Girl Scout routine. Drink this.” She shoved a water bottle into my hands. We walked toward the van. I wondered how many dead kids Annalise had seen. Maybe the number was so high they barely registered anymore. I climbed behind the wheel and buckled in. Annalise never wore her seat belt. She had other, less mundane protections. “Start the van,” she interrupted. I did. Once we hit the road, Annalise took a cell phone from the glove compartment. She hit speed dial. After a few seconds, she said: “It’s Annalise.” She told the person at the other end of the line Douglas’s name, address, and license number. “Check him out,” she said. “And I’m still waiting for a current report.” She snapped the phone shut without waiting for a response. At least I wasn’t the only one she was rude to. I focused on the road. The long, slow descent into an overcast northwest night was well under way. I turned on the headlights just in time to light up a sign that said Hammer Bay 22 miles. This time, Annalise didn’t protest. Aside from the rumble of the van, it was quiet. Suddenly, I didn’t like the quiet. She shot a deadly look at me. Oops. Sore spot. I didn’t say, That’s what I thought, too. I didn’t think the word meant the same thing to her as it did to me. We were silent for a couple of minutes. I kept seeing the boy’s face as the flames erupted around it. I kept hearing him say it didn’t hurt. I needed to keep talking, or I was going to start weeping again. We passed over the crest of a hill, and the Pacific Ocean suddenly appeared below us. Then I saw the town of Hammer Bay. We drove down the hill, straight toward the heart of it. Great action, horror, & suspense in that first chapter, it makes me believe that things can only get more evil and interesting from here on in. This was so COOL – i wanna more…. cant wait to actually read the book. Thanks, Kira. And you, too Allison. I simply cannot WAIT for the rest! Now, how many more days? Seven weeks as of today. I’m… mystified by your scene. Horrified, a little, but if I had the full book here now, I don’t think I would stop reading. I’m hoping to someday be a published author too (found a link here through the AW Water Cooler) but reading this… well, it almost makes me want to either never write again or quit my job, drop out of school, and become a word-producing robot in a desperate attempt to someday learn how to craft something like this. It’s that good. Congratulations on the success! I might even pick up the book if I see it, even though this genre really isn’t my usual cup of tea at all. Also, there’s no reason to quit writing or your job. I learned to write while I held down various day jobs and I don’t consider myself particularly talented. Whatever success I enjoy comes from study and practice. Augh, now I must buy this! Curse you and your chapter preview! This is probably the worst thing I’ve ever read, really–the worst! Well done! Off to buy a Kindle copy – I’ll post a review on my blog when I’m through reading. So happy to heat this is out. Really enjoyed the teaser chapter. I’m going to pick up a copy today. Say “Hi” to Marianne for me. Thanks, Stephen. I hope you enjoy it. And be sure to let others know if you do. It had all the elements that make an urban fantasy enjoyable, but it was without most of the cookie-cutter stuff that has essentially made me very tired of the genre. Hey, thanks, Stephen. And there’s definitely more to come! Be sure to tell your friends. Word of mouth is vital. Jim Butcher mentioned you in an interview as someone worth reading. After that chapter, I concur. I’ll have to buy you book. 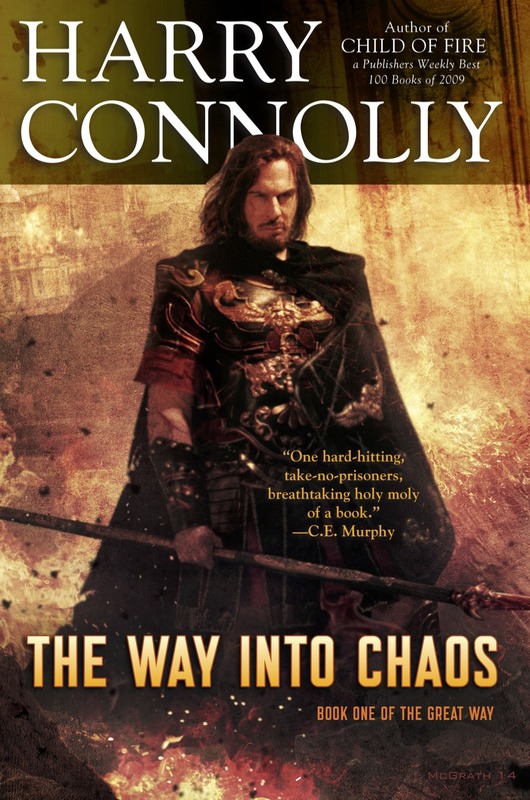 I saw the interview with Jim Butcher and followed a link, I need this book very very much. Loved that first chapter. Going to Amazon UK to put it on my wish list. I’m glad you liked it and hope you think the book is fun. There are no plans for an audio book at the moment, mainly because there’s no interest from the makers of audio books.